What a blast by the youngster. I like this kid's game. Matt Dumba seems to do everything at a high rate of speed. And from the big story of the day, yesterday. Well Wild fans, you all got your wish, and at a discounted price at that. 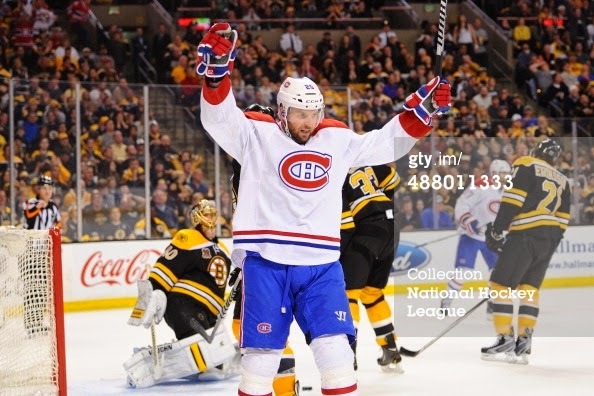 Thomas Vanek has come "home" for the next three seasons to play with the Minnesota Wild. Although Vanek was the only real big splash the Wild made in the off-season thus far, they are working on resigning much of their young talent by the start of the upcoming season. However, with new signings come people losing a spot on the roster. Among the losses are Dany Heatley, much to the joy of the Wild fans, and Clayton Stoner both going to the Anaheim Ducks. Heatley was just a thorn in the Minnesota Wild's salary cap and with him gone a lot of room opened up. 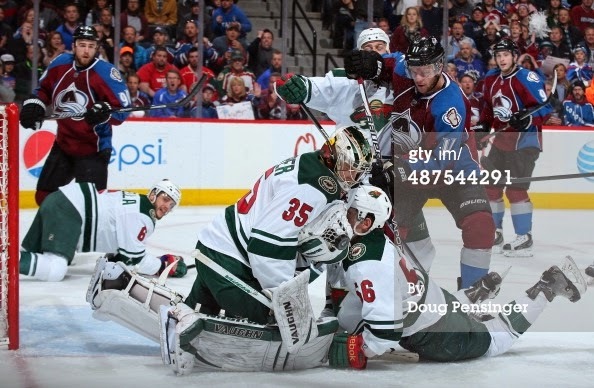 With Stoner, however, the wild lose 2/3 of the grit they had in the line-up, the other third going to Matt Cooke. If there is a road block in the upcoming season for the Wild, I think this is the spot to have it. Yes, they will have guys who like to hit some, like Matt Dumba and Keith Ballard, but there won't be that one guy who will drop the gloves when the team needs a kick start or protection from an opposing teams enforcer. If push came to shove, I'm sure Ballard or Brodziak would drop the gloves if absolutely needed, but I think it's still not enough. Darcy Kuemper and Ilya Bryzgalov. Bryz is not getting signed, as I'm sure much of you probably figured out after the season was over. As for Kuemper, he is still an unsigned restricted free agent and looking like he might be going into arbitration to come to terms on a new contract with the Wild. So who is going to be number one on opening night? I'd put money on Josh Harding with Kuemper as his back-up. Backstrom is the thrid goalie on roster, but remains a healthy scratch. Now, the rest of the roster. With the additions made, and with who is returning for the upcoming season, I think that the Wild will have one of the most feared rosters in the NHL. All four forward lines have speed and the potential to score, especially with a healthy Zucker, and a returning Fontaine to solidify an already potent roster of wingers. Up the middle of the ice Minnesota still has the three Finish centers, Captain Mikko Koivu, Mikael Granlund, and rookie sensation Erik Haula. I'd say that those three have a solidified roster spot this season, but as for the fourth center who knows. You have to start with the veteran Kyle Brodziak, but if his game starts to slip in his fourth line role, its still nice to have a couple of options. Recently signed Jordan Schroeder would likely be a good fit on the fourth line as well, and probably is the odd man out as of right now, but you can always slide Charlie Coyle to the center spot and call up another recent signing in Brett Sutter to play on the wing.
. After that, there is Jonathan Blum waiting for his chance to slide back into the line-up and another former Golden Gopher signing, Stu Bickel, waiting right after him. I don't see much change in how things operated back here from last season, but I would like to see a little less of the load put on Suter's shoulders. Will it happen? Probably not, but if he gets cut to around 25 minutes per game, I think he could produce as well as Shea Webber, or Duncan Keith. This is an opening day line-up, I think, can be rivaled to any line-up in the entire NHL. I think this is the year that the Minnesota Wild are finally considered as one of the elite teams in the NHL, provided that they stay healthy. This season is looking very promising for the boys in red and green, and could be one Minnesotans have been waiting for for a very long time. Team Canada got some good news today. Their defenseman Matt Dumba "will not" be suspended for kneeing Sweden's Erik Karlsson. Dumba is the only member of team Canada that is currently an NHL player. TSN.CA -- Hockey Canada was informed by the International Ice Hockey Federation on Monday that defenceman Mathew Dumba will not be disciplined further for kneeing forward Erik Karlsson during Team Canada's 3-0 loss to Sweden in a pre-tournament game for the World Junior Hockey Championship. Dumba was given a five-minute major penalty and a game misconduct for the incident. Any suspension would have been a blow to Canada's defence, which already has Griffin Reinhart serving a three-game suspension once the World Junior tournament begins on Boxing Day. s/t to First Round Bust... 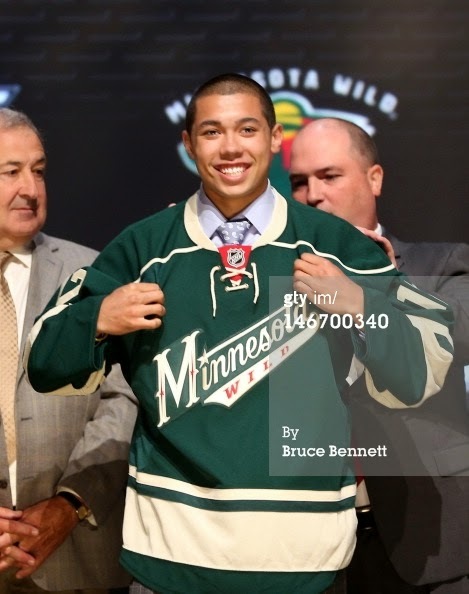 Check out this awesome goal by Red Deer Rebel defenseman and Minnesota Wild first round pick Matt Dumba. I would have to think that this goal will be end up being a top ten highlight goal this season. Incidently, that was the first goal of the year for Matt Dumba.